"Good morning, girls!" Lina greeted, rushing into the Neohome to give us all hugs. "Morning," I replied, finishing my Tchea fruit. I dropped the pit in the garbage and ran to the bathroom. The mirror reliably reflected the Aisha with green fur and white spots that was me. I washed my face, made sure my ears were straight, and popped a mint into my mouth to make Lina think I had brushed my teeth. I brushed them before bed, I truly did, but brushing teeth in the morning was just weird. "Ready to go?" Lina called up the stairs. "Almost," I hollered back. I took one more look at myself in the mirror, straightened my collar, and ran down the stairs. Little did I know that this would be the last time that I would look at that mirror and see a speckled Aisha. Lina smiled at me, and rubbed my head. "Be good, girls. We'll be back," Lina said to my sisters, Kata, Kimi, and Sweets. I was Cream, and I was her active pet today. I enjoyed the walk, as we journeyed from Tyrannia's omelette to Coltzan's Shrine to a secret, bouncy world to get Jelly. It was a normal day, just doing the freebies and enjoying being outside. We were just returning to Neopia when, suddenly it happened. I sniffed and rubbed my nose. Lina was staring down at me, mouth open with astonishment. "Normally, this is when people say 'Bless you,'" I instructed her. "Cream..." she whispered. "You're... you're a baby!" "What, for sneezing? Come on, everybody sneezes!" I said. "No, I mean, you're a baby. Young. Little. Tiny. Small!" I suddenly realized that Lina was taller than me. Well, she had always been taller than me, but now she was huge. And then it clicked. I opened my mouth and began to cry. I just couldn't help it. Tears rolled down my suddenly chubby, small cheeks as I blubbered and sobbed. Lina picked me up, cuddling me and humming a song. Slowly I stopped crying. "Wha... what happened?" I asked, sniffling. "Boochi. He zapped you right as you sneezed," Lina answered. "Are, you okay?" I nodded, and gasped with the effort. Why was it that my head was twice as big as my body? How could anyone hold their heads up like this? "Come on, let's go home," she said. She continued to carry me, and I played with my collar, which was suddenly much too large. I listened to her heart beat, and slowly began to close my eyes. How long had it been since she had carried me like this? Not since I was small. 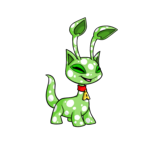 A tiny, green Aisha, just newly created. She had carried me then, back to the Neohome, to my waiting sisters. I had grown quickly, though, and soon I wasn't carried. I had a feeling I wouldn't grow up, though. If I stayed baby, I would stay small. I yawned and fell asleep. "Yeah, but a baby? Now? She won't be able to reach anything. She'll be totally dependent on us. And I'm not here all the time, which means most of the responsibility will fall on you guys. And she won't like not being able to do stuff." "Will it be up to her to decide? Whether or not... You know?" A pause, then, "Yes, it will. If she wants to be painted again, she can. If she wants to stay baby... well, I guess she could stay baby." "What about food? Can't babies only eat that mushy gross stuff?" "Soft foods, mostly. She won't like that either." "Shhh, I think she's waking up!" someone said. Lina ran over to me, and picked me up from the playpen in which I had been sleeping. "Hey there, Cream," she said. I looked over her shoulder at my three sisters. "Wow, Cream, you look ten years younger," Kimiko joked. I smiled, and paused when I felt the noticeably smaller teeth and wide gaps with my tongue. "What were you guys talking about?" I asked. I looked around with my sleepy eyes. "You," Lina answered. "We have a question for you." I yawned, and tried to pay attention. My already short attention span seemed to focus more on the bag of marshmallows I knew was in the cabinet than on the conversation. "Do you want to stay baby?" Lina asked me. I slowly turned my eyes back towards her and away from the cabinet. "Can I have a marshmallow?" I asked innocently. Lina blinked at me, surprised. "Um... ya, sure, I guess." She gave me to Kata and went to the cabinet. I reached up to touch Kata's collar, and realized mine had been replaced with a smaller one, meant for a baby Aisha. Kata smiled at me, and then laughed. "You always were my little sister." I smiled again, and Lina came back with a marshmallow. I reached for it and stuffed it in my mouth. I chewed it and chewed it until it was a foamy mush, swishing it back and forth in my mouth. I swallowed. Then Spot, my Gruslen, came into the room. "Spot!" I squealed, and reached for the floor. "Down," I asked Kata. Kata held me, looking at Spot. "Down, please," I repeated. "It's all right, Kata, Spot won't hurt her. He knows his owner," Lina said. Kata placed me down next to my petpet, who was suddenly the same size as me. Spot licked some of the marshmallow off my cheek. I giggled, and grabbed his tail. He patiently lay down while I played over and on top of him. "Cream, do you want to stay baby?" Lina asked me again. "Um... What will I be painted?" I asked, playing with Spot's ears. "Probably Speckled, unless you want a different color," Lina answered. "Okay," I answered, giving Spot a kiss on the nose. "Okay... you want to be painted Speckled? Or, okay you want to stay a baby?" "Speckled!" I squealed, as Spot licked me again. "Are you sure you want Speckled? You could choose almost anything," she said. "What can't I choose?" I questioned her. She had said almost anything. "You know my rules. No fire, magma, electric; basically nothing that will destroy the house," Lina answered. "Speckled!" I told her again. Who could give up looking like they have albino chicken pox? "All right, then. I'm off to the bank to get some Neopoints to buy a paintbrush. I'll be back," Lina said, standing up and heading for the door. "Can I have another marshmallow?" I asked Kata, who looked questioningly at Kimi and Sweets. "Would it be okay for her to have one?" Kata asked. "Yes!" I answered for her. I was ignored. "If she were normal, she would have another one. She's still Cream, only, little," Kimiko said. "Exactly," I said, ignored again. "She's only a baby. Too much sugar and she'll be bouncing off the walls and way too energetic," Sweets said, then paused as she realized she was describing the way I normally act. "I'll give her one more," Kata decided, and Sweets and Kimi agreed. I giggled as I was given another marshmallow. "What's it feel like?" Kimiko asked me. I shrugged and sucked on my marshmallow. "Oh shoot," I said, and crossed my arms. "What? What is it?" Kata asked me. "I forgot. When Lina asked me if I wanted another color, I've always wanted to be Alien!" I imagined having two more long ears. "We've been over this, Cream. You can't be painted Alien. You can only be zapped Alien by the lab ray, and you don't want that, do you? You might turn into a boy!" Kimi said. I wrinkled my nose at the idea. "Unless we get a Rainbow Faerie quest," I said. "That's true," Sweets agreed. "If we get a Rainbow Faerie quest, you can become an Alien." "In my opinion, she already is an Alien! I can't believe we're related!" Kimiko laughed. We all laughed too. I loved being Speckled, but being an Alien! The idea was exotic. "But... wouldn't you guys want to use the fountain if we got a quest?" I asked, suddenly feeling guilty. "I wouldn't," Kimiko said. "I was born to be desert." "I was born to eat dessert," I giggled, finishing the last of my marshmallow. "I don't think I would," Sweets said. "I like being checkered. It's not too plain, but not too fancy. It's perfect. It's me." "I'm happy being Christmas," Kata said. "Although I'm glad Lina doesn't make me wear those ridiculous antlers or that nose. But I'm just happy I have a great family." We all nodded; we were lucky to have a family as great as ours. Kata knew that better than anyone, because she was adopted. "It's decided, then," Kimiko declared. "If we ever get a Rainbow Faerie quest, we're dunking Cream in and turning her into an Alien!" Just then Lina opened the door, carrying a bag. "Come on, Cream! Let's go to the Rainbow-"
"Fountain? We got a quest?!" I squealed! Lina looked at me. "Um, no. To the Rainbow Pool. I've got your Paint Brush," she said, revealing the Speckled brush. "Oh, yeah." I smiled and crawled over to her. She picked me up and I waved to my sisters. "Speckled, here I come!" I yelled. We walked (well, Lina walked and carried me) to the Rainbow Pool, watching as excited owners painted their happy pets for the first time. "Remember when we did that?" Lina asked me. "Yup!" I answered. "Time to do it again!" She carefully set me down in the warm water, cupped her hands, and poured water all over me. Then, once I was completely wet, they picked up the Speckled paint brush, dipped that in the water, and ran it over my head until the paint ran out. I kept my eyes open to watch the transformation in the water. Last time I was painted, I had blinked and missed the entire thing. It took longer this time, maybe because I was so small. First, the speckled paint stretched over me, and I seemed to stretch too. Suddenly it was over. I was Speckled! "Cream? How do you feel?" I opened my mouth. "I... I..." I couldn't talk! Or breath, for that matter. I grasped for my neck and ripped the baby Aisha collar off. "Man, that thing is small," I said, gasping for air. Lina smiled and handed me my real, proper collar. I looked at my reflection, happily Speckled, in the water. "Come on, Cream, let's go home." That night I stared at my reflection in the mirror. All right, so maybe I was exaggerating a little when I said that I would never look in a mirror and see myself as a Speckled Aisha. I would actually do that quite often, from now on. After all, it was only a matter of time before we got that Faerie quest, and I would be an Alien. I was finishing my English essay on how I would escape being captured and put in a bottle when Rose came in. Already I knew something was wrong.